Are you like Popeye and can’t get enough Spinach? 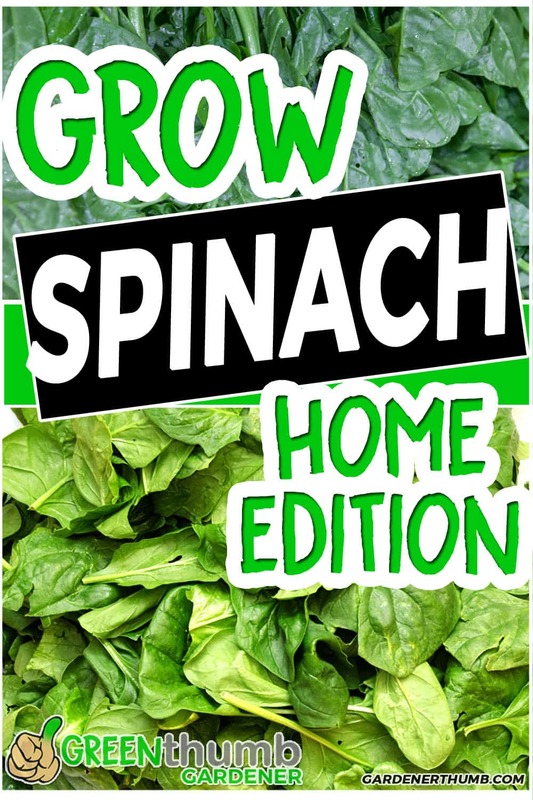 Do you need an easy guide on how to grow spinach at home? Take a look at this epic guide on how to grow spinach from seed to table. What could more satisfying than growing your own spinach at home? 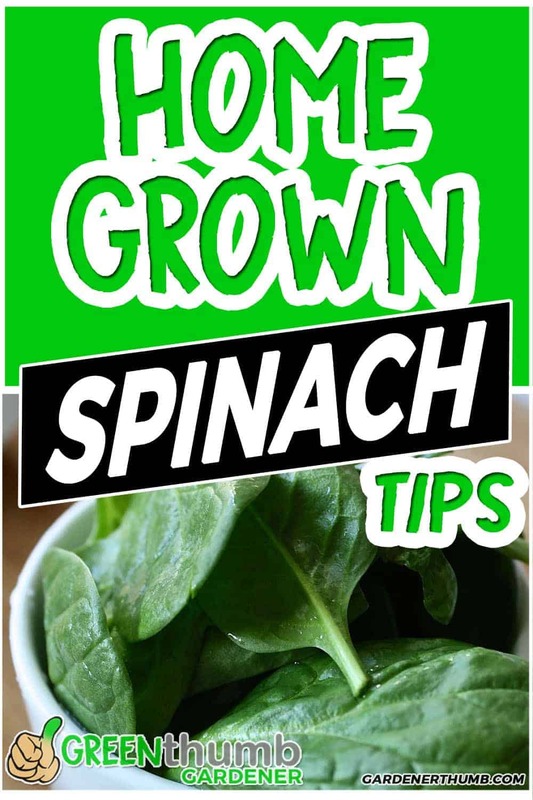 You will discover just how easy and simple it is to grow spinach following the step by step instructions below. Spinach is a cool season crop, which means it’s almost never too early to plant it. Spinach comes in two main types, smooth leaf varieties that are sweet, tender and perfect for salads and crinkle leaf types that have thicker crinkly leaves. These are leaves that hold up better to cooking. You want to select a variety of spinach that you will enjoy eating. Personally, we prefer the baby leaf smooth spinach plants because they are easily added to our nightly salads. We tend to grow these types for our personal taste. You may find that growing spinach with savoyed leaves are better because of the many dishes you prefer to cook. A few hints on selecting the right variety. Make sure you look on the back of the seed packet or the information prior to purchasing it. It will have all the right information you need for growing that particular variety of spinach. Spinach is normally grown directly from seed, but transplants can greatly speed up the process if you are approaching warmer temperatures or forgot to start from seed. Look for study compact plants that are deep green color and avoid tall leggy plants with weak, thin stems. Growing spinach is ideally done during the early spring or fall seasons. This is due to spinach being a cooler climate vegetable. It prefers the shorter days and cooler temps. Popeye would not do good in the dead heat of summer. Folks want to grow spinach all year round or most likely they try to grow it too late in the season. You are lucky if you get most spinach to go past early to mid-June. It is tasty while you have it, but not able to be grown past June because of the fact that it bolts very quickly. This seems to discourage a lot of gardeners, so just remember to get it in early or wait until the fall approaches so you are not disappointed. Cool soil is your friend when you are growing spinach at home. You want to be able to work the soil, so generally daytime temps that are at or just above 40 degrees Fahrenheit is ideal for growing spinach. The night time temps can still be freezing because spinach does tolerate the cold and is hardy in these temps, just as long as the daytime temps are above freezing. The sweet spot is between February and March in most areas of the US. It is best to transplant your spinach plants if you want to start earlier because they will not germinate as fast in freezing temps. The ideal soil for growing spinach at home is one that is very well broken down, well-draining, and has lots of organic matter. This is due to the fact that growing spinach requires a ton of nutrients. Spinach uses a lot of nutrients to grow and it’s one of the heaviest feeding leaf crops in the garden. One of the things that you want to do to help with growing spinach is to add a good amount of compost every spring to keep that organic matter up. You also want to make sure that the soil has some sand in it which is very similar to ideal soil for lettuce. You don’t want the roots of the spinach to be rotting. Growing spinach plants in early spring present the problems due to the soil being very damp and cold. The sand will help the soil drain properly which will help the spinach grow. Most early spring crops are the most prone to root rot because the bacteria that live in the soil thrive in that cool damp environment. You don’t have nearly as much of a problem as the temperature heats up because the soil tends to dry out on a more regular basis. 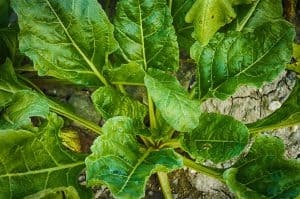 You want to use a fertilizer for growing spinach that has both fast acting nutrients as well as the slow release nutrients. It is very important because of the fact that spinach grows very fast. Spinach is one of the faster-growing vegetables. A good mix to add is a blend that is not too high in nitrogen. Adding too much nitrogen to Spinach can give it a metallic taste. You still need nitrogen, but it is not the same as the needs for say lettuce. 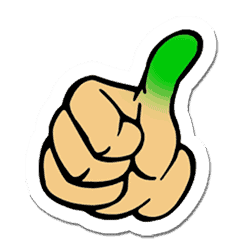 A good fertilizer that has the right amounts is in the range of 2-5-3 ratio of NPK. A good brand we have used is Jobe’s Organics. It has the right blend for growing spinach at home and it also contains helpful microorganisms that are essential for building healthy soil. Check out the latest prices that are found here. You can make your own blend if you want to mix in blood meal, greensand, and potash in the right ratios. We make our own and purchase already made fertilizers especially when there is much to do in the garden. A good homemade recipe we frequently use can be found here. Growing spinach requires you to fertilize right after you plant because it needs some food to get going. You can give it about a 1/4 cup per square foot and work it into the very top layer of the soil as the roots don’t go too deep. It will be available for the spinach plant right away and slowly breakdown as it grows. Check out our guide on NPK if you need more information that can be found here. There can be a ton said about the proper spacing to grow spinach at home. Spinach typically grows to a plant that can anywhere from 4 to 7 inches in diameter. You can look at the back of your spinach seed packet and it will tell you to space them 3 to 6 inches apart. This spacing of 3-6 inches will not yield a ton unless you are planting a large capacity. We typically use a more intensive gardening approach and can heavily seed this about 1 to 2 inches. Your plants might not grow as large, but your yield will be much greater. It will give you more spinach plant leaves to pick in the same square footage. There are some hard fast rules when you are growing spinach such as sunlight and watering, but the spacing guidelines can be played with. Our approach is to start seed in seedling trays and then place out in the garden densely. Find out what is best for you. Check out our Spinach plant spacing guide here for more options and information. Growing spinach requires a good amount of care. You want to make sure that your spinach garden area gets at least 4-6 hours of sunlight. Spinach does require mostly sunlight but can tolerate some shade. Make sure that you shade your spinach seedlings if you are transplanting them outside for the first day or so. You could also choose to plant them on a shady day to minimize its exposure to allow the spinach plant to settle in its new home. It is always best to err on the side of caution when you first plant the spinach to give it a good start. We discussed earlier the soil guidelines for spinach and how mixing in some sand will benefit the roots. Spinach roots do not like to be soggy, so this soil mixture will go a long way to prevent this. Growing spinach requires a light amount of water to grow successfully. Just make sure you don’t water the spinach plants too much or let it dry out. Cover your spinach seeds with soil. You can pat the dirt down gently to make sure the spinach seeds are covered. Keep your soil moist with water until the spinach seeds germinate. Germination usually takes about 7-10 days to germinate, but it varies with the soil temperature. Maintain your spinach plants with proper watering. Follow the watering guidelines and don’t over water them! Harvest your spinach leaves once they have fully matured to your variety. Spinach can be harvested in as little as six weeks after planting the seeds. Begin harvesting when the spinach has put out about six to eight good size leaves. Use your fingertips to pinch off just the leaves you care to eat. You can also use a small pair of shears to cut out the entire head. Continue harvesting until the plants go to seed or bolts. Spinach can be one of the vegetables that you should get in your garden during the cooler seasons. It is so easy and versatile to grow. Trust me that you will notice the difference in tasting your own spinach versus what you get in the bag at the supermarket. Just grow spinach at home today! We also have a monumental guide on Spinach that you will find here. How long does spinach take to grow? – Spinach takes about 5-6 weeks to grow depending on the variety. Is spinach hard to grow? – Absolutely not. Spinach takes very little effort once it germinates to grow. Just get started. Can I grow spinach indoors? – Spinach can be grown indoors in containers. It requires about 6 hours of light, so a sunny area or minimal lighting is needed.